This is the end of GEOMarketing Days. Thank you all for following this live event. All the contents broadcast during this event remain available (below). Hormann develops its retail outlet and reseller network in China with geomarketing . "Ensuring a comprehensive service and professional consultancy every day to our customer is extremely crucial. The solution enables a better understanding of our territorial areas development and our real sales potential” said Sascha Wechesser, After Sales Service & Installation Manager. Here is GEOCONCEPT geographic data partner. Jacques-Etienne Grandjean, vice-CEO of EMEA, talks about the new uses of cartographic data : indoor cartography and navigation, trafic analytics, Internet of the Tools. Geomarketing analysis of the Healthy Food network. Key notions for analysing, optimising, and extending your distribution network. The French leader in outdoor Advertising JCDecaux optimizes the management of its panels advertising - more than 120 000 in France - and proposes dynamic media schedules to its advertisers. Build predictive models to understand results, and use segmentation tools to acquire deeper customer knowledge. 1. “geoIoT” and production systems optimization: the connection of some home devices (AC, heater, washing machine... for instance) helps to regulate the production and transportation of electricity. Thanks to geolocation, the analysis and real-time tracking of the spatial pattern consumption helps to manage the "smart grid". 2. “geoIoT” and the digital enterprise: the scheduling of reparation, maintenance or refilling operations can be optimized automatically through routing engines thanks to the location information. Also, this can also be done for moving objects such as cars and trucks for example. The scheduling process can be 100% digitalized compared to years ago when the location had to be collected and computed manually. 3. “geoIoT” and the new business model: recently, a brand of luxury cars has announced that in large cities it will offer to refuel the car on location, when it is detected as almost empty. This is one of many business opportunities offered by the geolocation of IoT. 4. “geoIoT” and our daily life: eyeglasses or tools: entrepreneurs have launched geolocated products, helping customers to quickly find any objects. 5. “geoIoT” and customer relationship: your watch has detected that you are a frequent user of bicycle lanes. This information helps companies suggest new products or services adapted to your life style. The connection with Geomarketing. Geomarketing helps optimize the use of “goeIoT” data. It gives a social and economic context to the located information. It is key for the understanding of the spatial patterns and behaviors. In an economy more and more driven to “using” rather than “owning”, geomarketing can help guarantee user loyalty. Belgian National Lottery develops its retail outlet network with geomarketing. Carglass is piloting the development of its network with geomarketing. Workshop / Which districting is right for your strategy? Applying the right method and practice to a districting exercise. Identifying the most pertinent method via some illustrated examples. - in real time: geomarketing finally becomes a key operational element of the customer relationship, in particular via geofencing: the localization of the content of a website or app that allow real-time information to be taken into account given the context of a customer localization (competitive environment, proximity of the offer, possible type of activity ...). - more analytics: geomarketing allows a better understanding of consumers spatial behavior. Visits to points of sale and attendance to other places such as, websites and mobile app ... Geolocalization captures much more information than did the simple address on file for loyalty card holders. While it offers far more possibilities for businesses, geolocation is also a formidable tool in favor of the consumer who can in real time compare the offers by proximity or opportunities offered by various channels and be free to choose without the limitation of Geographical distance. Generating reports as decisional aids. See for yourself how reports can be used as decisional tools, and get to know your way around the Reports module environment. SODIS, a field marketing specialist, opted for GEOCONCEPT’s sales districting and route optimization solutions to optimize its 150 field sales promoters’ calls. As a bonus, in certain regions, productivity gains of up to 15% in journey time and 20% lower mileage. « Thanks to the TourSolver solution, field sales staff paying store visits enjoy greater flexibility and working comfort and can concentrate more on their core business of point-of-sale service » SODIS CEO, Cyril Gache. Discover how to make an optimal districting through 4 video sessions. The importance of geolocation in Geomarketing. "If the location is truly that important, how then, do you determine what’s best for your business?" Convex areas, theoretical catchment areas, isochrone areas: discover the essential tools of spatial analysis. Idea / What is geomarketing ? Geomarketing could be defined as "the use of concepts and methods coming from Geography to solve Marketing questions". Geomarketing helps to understand the location and spatial behavior of consumers and competitors in order to improve the way an Enterprise covers its market. 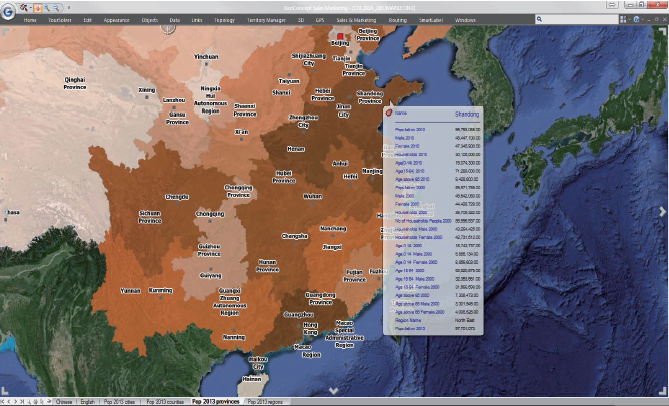 The techniques in use relate to collection and organization of geographic information, map vizualisation and spatial analysis, which is the analysis of phenomenons taking into account their location. Nowadays, Geomarketing goes far beyond the simple question of store location. In fact, many operations have a geographic dimension: Companies comunicate locally, they adapt offers and pricing, they use geographic criteria to differentiate their websites and digital campaigns, they define objectives and analyze results for each region or local market area, they visits customers and prospects, they try to understand customers based on the knowledge of their local market environment, they deliver products and services... For all of this, they can benefit from more and more advanced technologies, among which geolocation and geomarketing add-on and solutions. In a way, Geomarketing marks the integration of the geographic dimension into the Companies. Search for efficiency, more and more complex network organization, cross-canal management of customers integrating the idea of proximity... for many reasons, geographic performance is becoming a key of the overall performance of a Company. Although young and still growing, the Geomarketing has yet had three ages. The first age, during the 90's was dedicated to location management. The intense development of mobilephones networks, of specialized retail chains, franchisee networks, banks branches... were in favour of the integration of Geomarketing technics into many companies. 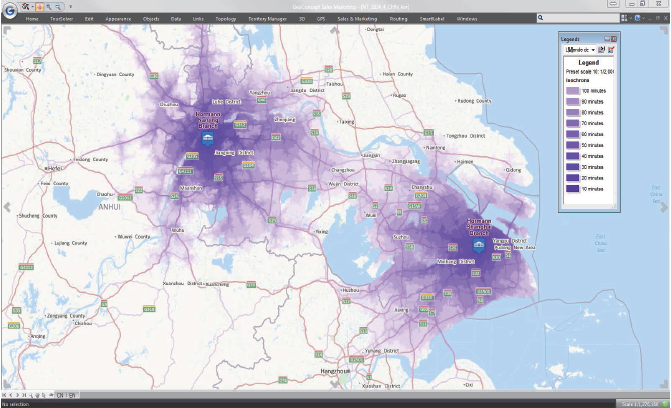 At this time, Geomarketing has benefited from the appearance of GIS (Geographic Information System) desktop solutions and their capabilities: spatial data management, mapping and spatial analysis. Then, the turn to a "more marketing" geomarketing has characterized the second age. The influence of local competition, the creation of local segmentations and locally adapted strategies and tactics and the use of the newly created CRM database helps to have a more systematic and efficient use of the Geomarketing. New spatial data mining capabilities andweb based geobusiness intelligence possibilities helped to develop a more expert but also a more collaborative Geomarketing. The third period has just started. It is characterized by the incredible development of geolocation and real-time capabilities. It gives more power to the consumer who can continuously compare the local offers and challenge the different sales channels. It forces the Companies to reconfigurate their distribution organization to integrate the cross-channel capabilities, to mix marketing with "production" constraints (like service or product delivery) and to develop a smart use of the geolocation data which is not yet implemented in many companies. Based on a standard scenario, learn good practices and develop functional reflexes. GEOCONCEPT offers a wide range of geomarketing solutions to connect your market and customers : create targeted and effective multichannel communication, identify catchment areas, conduct location and prospecting studies, analyze your local performance… GEOCONCEPT Group numbers more than 10,000 client references in more than 35 countries and more than 100,000 optimised resources.